In 2372, the Bothans attacked Voyager with a bio-electric field that caused the crew to experience hallucinations. It put the crew under some kind of psychoactive trance which disabled the ship. Kes' telepathic abilities allow her to resist the Bothans and to restore the crew to normal. Later that year, Voyager found a second Ocampa colony in a second array under the guidance of Suspiria, the Caretaker's female counterpart. These Ocampa had advanced telepathic abilities and their leader, Tanis, tutored her while secretly plotting with Suspiria to take Voyager. When she demonstrated her new skills to Tuvok, she accidentally boiled the water in his body and he was severely injured. Nevertheless, he said she should continue her training under Tanis, who told Kes to join them. Tanis encouraged her to pursue destructive abilities, inducing her to incinerate the plants in hydroponics. When Suspiria attacked the crew in revenge for the Caretaker's death, Kes attacked Tanis telepathically and Janeway deployed a non-lethal toxin to disable her. Being shown mercy caused Suspiria to leave with Tanis; his departure caused Kes' power to return to its previous level. She was disturbed by the harm she did with her enhanced abilities; Tuvok told her that she must learn to control, rather than fear, such impulses. Voyager passed through a divergence field that caused all sensor readings to double and every particle on the ship, except antimatter, to duplicate forming a second Voyager and crew. The field caused extensive damage to the first Voyager. Kes vanished in a mysterious void, Harry Kim was sucked out into space and Samantha Wildman's baby died. Kes led Janeway back to the void to take her back to her ship. When the Vidiians attacked, they killed the duplicate Kes and they themselves were destroyed when the duplicate Voyager self-destructed, but not before Kim returned with Wildman's baby to the other Voyager. Kes, along with the rest of the crew, was marooned on Hanon IV after the Kazon had captured the ship. She was captured by the primitive tribe on the planet who were amazed at her blond hair and light skin. Chakotay later rescued her. A few weeks later, Voyager entered the core space of the Borg and stumbled across the Borg-Species 8472 War. As a result of the telepathic nature of Species 8472, Kes began to experience visions of the future, and later began to communicate with the race. When they realized her nature, Species 8472 began reading Kes' memories. The communications ceased when the species retreated from the Delta Quadrant. Only a few days later, Kes began to undergo a massive surge in her mental powers. Although it was theorized that the exposure to Species 8472 caused these changes, there was little evidence for this. For whatever reason, Kes became telekinetic and was able to carry out delicate surgical procedures using only her mind. Unfortunately, she rapidly started to destabilize at the subatomic level and was causing massive damage to Voyager as a result. Taking a shuttle, she left the ship to explore her new condition and, as she left the corporeal world behind, pushed Voyager out of Borg space, 9,500 light years closer to Earth, as a parting gift. In the original sequence of events in 2376, Voyager received a distress call from a small ship. Sensors revealed that the ship had one Ocampan lifeform on board. It was an aged Kes, who requested to be beamed aboard Voyager. When Janeway questioned her motives, Kes responded by ramming Voyager with her ship and boarding the Starfleet vessel. In her old age, Kes had forgotten she had chosen to leave Voyager and thought the crew had abandoned her when she had become too troublesome. Subsequently, she hunted down Voyager, seeking revenge. She made her way to engineering, using her powers to cause extensive damage along the way. 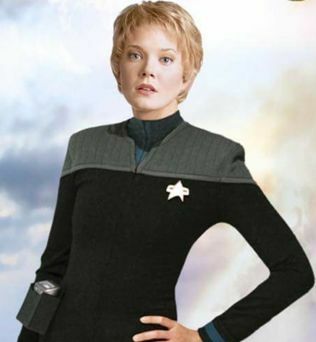 When she reached engineering, Kes murdered B'Elanna Torres and used the warp core's energy to enhance her powers and travel back to 2371, shortly after Voyager had become trapped in the Delta Quadrant. She attempted to prevent her younger self from developing her powers, making a deal with the Vidiians to attack and capture the ship, while taking the younger Kes back to Ocampa. This attempt was thwarted by Captain Janeway, who had been alerted to the possibility of time travel as Tuvok had been experiencing 'flash-forwards' due to exposure to tachyon particles caused by the presence of the future Kes, ranging from mentioning the Delta Flyer around four years before its construction or witnessing Naomi Wildman before her mother announced her pregnancy. In a confrontation in the airoponics bay, Janeway was forced to kill the older Kes when she was knocked off-balance during a Vidiian attack. She and Tuvok subsequently explained the situation to Kes of the present, who recorded a hologram that would dissuade the Kes of 2376 from making the time jump. In the new version of 2376, Kes once again assaulted the ship, but Janeway was able to divert the crew from Kes's path, minimizing the damage she inflicted on the ship. When she reached engineering, she found the warp core off-line. A hologram that Kes had recorded of herself before leaving Voyager was activated. The holographic image reminded her that she was responsible for her own fate. Kes responded emotionally and ceased hostilities. Janeway offered her a place on the crew but she refused, opting instead to return to her homeworld. After the destruction of her homeworld in 2379 Kes joined the crew of the Lexington as a medic along with her brother Jovan.